^ de Basily, N. (2017-07-06) . 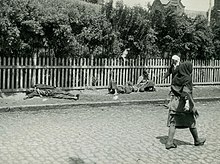 Russia Under Soviet Rule: Twenty Years of Bolshevik Experiment. Routledge Library Editions: Early Western Responses to Soviet Russia. Abingdon, Oxon: Routledge (published 2017). ISBN 9781351617178. Retrieved 3 November 2017. [...] vast sums were spent on importing foreign technical 'ideas' and on securing the services of alien experts. 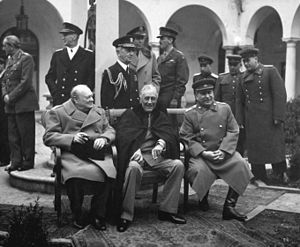 Foreign countries, again - American and Germany in particular - lent the U.S.S.R. active aid in drafting the plans for all the undertakings to be constructed. They supplied the Soviet Union with tens of thousands of engineers, mechanics, and foremen. During the first Five-Year Plan, not a single plant was erected nor was a new industry launched without the direct help of foreigners working on the spot. Without the importation of Western European and American objects, ideas, and men, the 'miracle in the East' would not have been realized, or, at least, not in so short a time. ^ Jones, Jonathan (29 August 2012). "The fake photographs that predate Photoshop". The Guardian. Retrieved 27 August 2016. 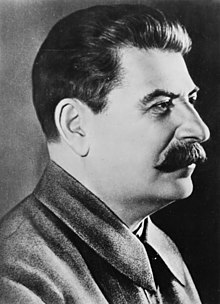 In a 1949 portrait, the Soviet leader Joseph Stalin is seen as a young man with Lenin. 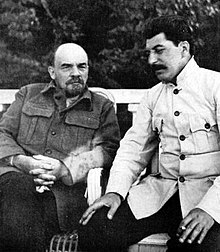 Stalin and Lenin were close friends, judging from this photograph. But it is doctored, of course. Two portraits have been sutured to sentimentalise Stalin's life and closeness to Lenin. ^ "In Russia, nostalgia for Soviet Union and positive feelings about Stalin". Pew Research Center. June 29, 2017. Retrieved 23 July 2018. 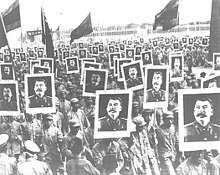 ^ "Public opinion of Stalin improves over past few years – poll results". RT International. 14 January 2016. Retrieved 15 January 2016. ^ Anne Applebaum (2014-10-14). "Understanding Stalin". The Atlantic. Retrieved 2015-04-04. Gill, Graeme J. (1998). Stalinism. Palgrave Macmillan. ISBN 978-0-312-17764-5. Retrieved 1 October 2010.